Digital Water based sublimation ink, also called low temperature disperse ink or low temperature sublimation ink. It works as print sublimation ink to transfer paper, and then heat and press transfer to destination substrate; or direct print on coated fabric, and then heat to firm color. This ink usually used to transfer to fabric with more than 60% polyester, or transfer to rigid substrate as: ceramic, glass, crystal, mental, plastic etc. Digital Ink can offer best sublimation ink to our clients, especially for black colors sublimation ink, our black colors is 100% same with Korea inktec. From color transfer rate to color fastness, our sublimation ink quality all can be compared with Korea sublimation ink. 5. 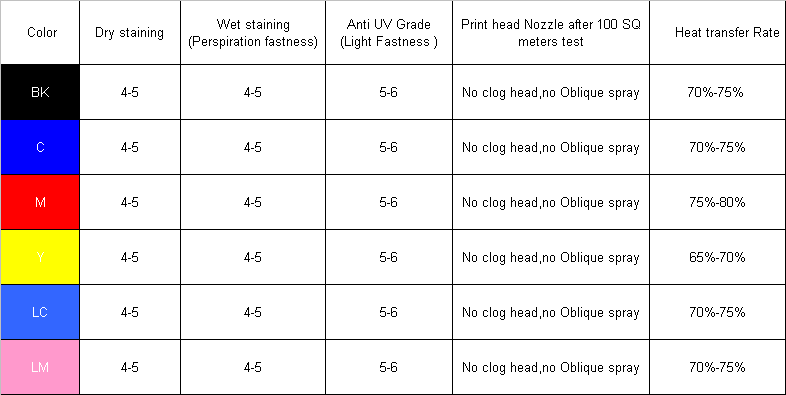 Suitable for piezo printers like EPSON, DGI, ROLAND, MIMAKI, MUTOH. Sublimation ink suit for Epson/DGI/Mimaki/Roland/Mutoh supplied with ICC profile for digital textile printing on Polyester, Nylon, Polyurethane, etc. and hot transferring on metal, porcelain, plastic, carpentry, etc. materials with coating. It can be printed on T-shirts, porcelain, clothes, glass and textile, decoration, outdoor advertising, gift field, fabric industry, portrait industry, label and card industry.